Celia Frost is a freak. At least, that's what everyone thinks. Her life is ruled by a rare disorder that means she could bleed to death from the slightest cut, confining her to a gloomy bubble of 'safety'. No friends. No fun. No life. 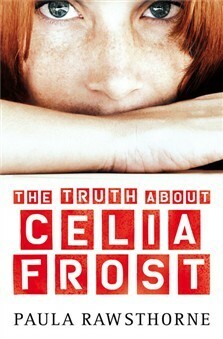 But when a knife attack on Celia has unexpected consequences, her mum acts strangely - and suddenly they're on the run. Why is her mum so scared? Someone out there knows. And when they find Celia, she's going to wish the truth was a lie. A buried secret, a gripping manhunt, a dangerous deceit... What is the truth about Celia Frost? I kind of feel like there should be a dramatic 'dun dun DUN!' after that last sentence. And really - this book is full of the drama. (Please read 'drama' as 'Drah-Mah' for added effect.) I spent the first part of this novel hoping that it wasn't going to be a supernatural thriller and the remainder of it wishing it was. It's not that I didn't enjoy it - it is a very intriguing story with an intriguing premise. Celia is shunned from public interaction - isolated, meek; add to that standing out with insanely orange hair and being unnaturally tall and gangly - any teen would be moody. But then she finds out that her mother has been lying to her her whole life - and suddenly Moody Celia turns into Rebel Celia, defying her mother at every opportunity. And it takes another painstaking quarter of the novel to find out WHY her mother lied. An interesting idea, yes. But the characters were flat and unconvincing (can anyone explain what's with Frank and his hard-on-the-outside but soft-on-the-inside personality and how that is not predictable in any way?) and the story left me feeling as if I'd not learned anything from it - I won't be thinking about this one much at all once it's back on the shelf.